There are 15 Assisted Living Facilities in the Franklin area, with 2 in Franklin and 13 nearby. The average cost of assisted living in Franklin is $4,047 per month. This is higher than the national median of $3,346. Cheaper nearby regions include Wrentham with an average starting cost of $3,760. To help you with your search, browse the 82 reviews below for assisted living facilities in Franklin. On average, consumers rate assisted living in Franklin 4.1 out of 5 stars. Better rated regions include Wrentham with an average rating of 5.0 out of 5 stars. Caring.com has helped thousands of families find high-quality senior care. To speak with one of our Family Advisors about assisted living options and costs in Franklin, call (855) 863-8283. Franklin is a town in Massachusetts located about 46 miles southwest of Boston. Its population is estimated to be 32,996 as of July 2017, and 11.8 percent of these residents are 65 or over. To help support this senior population, there are 15 assisted living facilities in the Franklin area. Two of them are located in Franklin, and the other 13 are in nearby communities, including Walpole, Milford, Wrentham and Hopedale. Assisted living facilities are officially known as Assisted Living Residences, or ALRs, in Massachusetts. The state's Executive Office of Elder Affairs (EOEA) is responsible for the regulation and certification of these ALRs. The year-round climate in Franklin is relatively comfortable, especially in the spring, summer and fall. The average high in July is around 84 degrees. Winters in Franklin are generally cold and snowy, as the area receives about 41 inches of snow each year and the average January low is 15. Seniors who find winters challenging may want to keep this in mind as they search for assisted living communities. Crime is relatively low in Franklin, so seniors can feel safe living here. On a scale of one (low crime) to 100 (high crime), Franklin's violent crime is 24.1 and property crime is 18.8. These are both below state averages of 31.6 and 21.1, respectively, and the averages for the Boston-Cambridge-Newton Metro area of 34.2 (violent crime) and 34.5 (property crime). The cost of living in Franklin is about on par with state averages, but is slightly higher. On a cost of living index where the national average is 100, Franklin is 152, and the Massachusetts average is 139. The Franklin area is home to world-class medical facilities, including Milford Regional Medical Center, in the event of medical emergencies or illness. The Greater Attleboro Taunton Regional Transit Authority (GATRA) provides bus service for the Franklin area. They offer discounted rates for seniors and stop at many popular places in town. Massachusetts is moderately tax-friendly for retirees. Social Security and public pension income are fully tax exempt, while other forms of retirement income, including a 401k, IRA and private pension are subject to the state's income tax rate of 5.1 percent. Assisted Living costs in Franklin start around $4,047 per month on average, while the nationwide average cost of assisted living is $4,000 per month, according to the latest figures from Genworth’s Cost of Care Survey. It’s important to note that assisted living rates in Franklin and the surrounding suburbs can vary widely based on factors such as location, the level of care needed, apartment size and the types of amenities offered at each community. 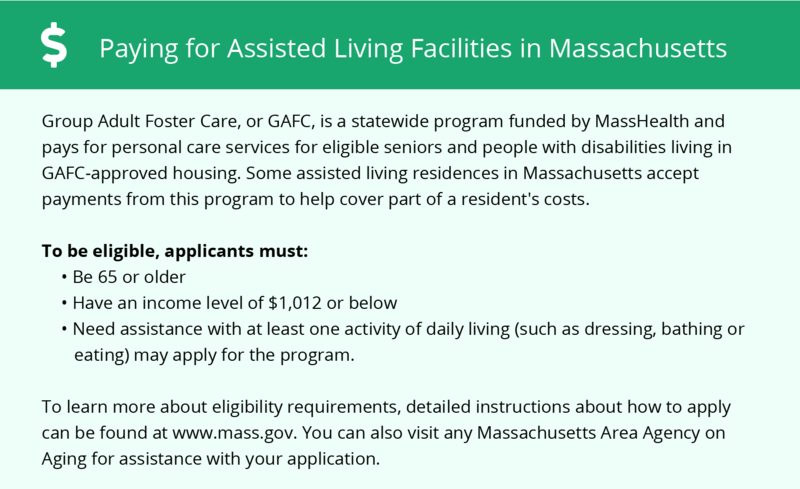 MassHealth, which is Massachusetts's Medicaid state plan, pays for assisted living services in ALRs. It also helps seniors pay for Adult Foster Care (AFC) and other forms of elderly housing. 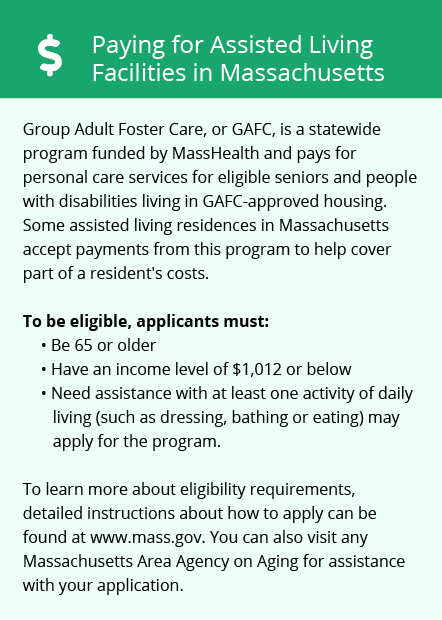 Seniors have to meet certain criteria to qualify for MassHealth. Franklin and the surrounding area are home to numerous government agencies and non-profit organizations offering help for seniors searching for or currently residing in an assisted living community. These organizations can also provide assistance in a number of other eldercare services such as geriatric care management, elder law advice, estate planning, finding home care and health and wellness programs. To see a list of free assisted living resources in Franklin, please visit our Assisted Living in Massachusetts page. Franklin-area assisted living communities must adhere to the comprehensive set of state laws and regulations that all assisted living communities in Massachusetts are required to follow. Visit our Assisted Living in Massachusetts page for more information about these laws.